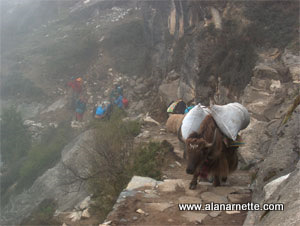 Kathmandu, Lukla and the Khumbu are all filling up with climbers, and trekkers this spring. The last fixed wings flights to Lukla are running about normal before being shut down for airport construction April and May. Everest Base Camp on the Nepal side is taking shape with team after team sending their Sherpas to build tent platforms and the cooking facilities. China has closed Tibet to foreigners until April 1st fearing protests around the time of the March 10, 1959 Tibetan uprising. This is almost an annual event and rarely impacts Everest climbers. On the “climbers to watch” list, I’m adding Adrian Ballinger of Alpenglow. In addition to guiding his teams on the Tibet side, Adrian will immediately go to Pakistan and attempt K2 without oxygen this summer. He summited Everest in 2017 without supplemental Os. Sung Taek Hon has arrived in Kathmandu for his 5th attempt of there South side of Lhotse. Alan, thank you for this coverage! I had been following it every year from Finland and every day I wait for a new post 🙂 I have been to EBC twice and hoping to go back, soon. All the best for you and for your important work with the Alzheimers. Alan: I love your blogs and have been reading them for a couple of years….which has inspired me to contemplate doing a Summit Trek to EBC in October. I’m very excited at the prospect! Thank you for your awesome coverage. Hi Martha. Thanks. I really hope you get to trek to EBC – it’s a wonderful experience. Thanks for your updates Alan, we look forward to them. Very quiet on the trekking front further up. We have been the only guests in 3 lodges. Thanks for the update Lynn. Still a bit early.